The latest survey results from seven European Union countries reveal a wide range of views across the region about the economy, the future and the EU itself. Just ahead of the parliamentary elections, here’s a tour of the sentiment expressed by the public in each nation. The British economy was particularly hard hit by recent economic crisis. In 2009, the economy shrunk by 5.2%. But in 2014, the UK economy is now expected to expand by 2.9%. Not surprisingly, there has been a parallel dramatic turnaround in the British mood in just the last year: 43% of Brits say the nation’s economy is now doing well, up 28 points since 2013. Among all the European publics surveyed, the Poles are the most committed to all aspects of the European Union. Seven-in-ten Poles have a favorable view of the Brussels-based institution, compared with a median of 51% in the other six member states. Why? Perhaps the economy is the reason. Roughly half of Poles say that European economic integration has strengthened their economy, compared with a median of only 32% elsewhere. Half or more of Poles give a thumbs up to the European Parliament, the European Commission and the European Central Bank. But the Poles are divided over giving more power to the European Union: 44% favor it, 41% oppose. This is the lowest opposition to strengthening Brussels among the Europeans surveyed. Italy’s continuing economic woes and political dysfunction have contributed to growing public disgruntlement across the board. Only 9% of Italians think the country is headed in the right direction. Almost all Italians say their economy is performing poorly, and it is. And no wonder: The International Monetary Fund reports that the Italian economy shrunk by 1.9% in 2013 and will grow by only 0.6% in 2014. About a third of Italians actually expect their economy to worsen over the next 12 months. And two-thirds expect the next generation to be worse off than the current one. The Italians have the most damning judgment of economic integration among the countries surveyed. About three-quarters of Italians say economic integration has weakened Italy’s economy. Half the Italian public has a negative view of the EU, second only to Greece. Moreover, 44% want to abandon the euro and return to using the lira, a 19 point drop in support of the common European currency in just one year. Italy is the only euro area country surveyed where less than half the public is supportive of keeping the euro. Germans stand out from other Europeans in their optimism about the economy and positive views of European integration. Germans are 75 percentage points more likely than the European median to say their economy is doing well and 31 points more likely to think their country has been strengthened by economic integration with the rest of Europe. It is little wonder then that 59% of Germans are satisfied with the direction of their country and 85% think their economy is good, both sentiments the greatest in Europe. Germany has outperformed the euro area as a whole every year since 2010, according to the International Monetary Fund. Two-thirds of Germans have a favorable impression of the EU, compared with just half the public in the six other EU nations surveyed who hold this view. However, they are much more inclined to complain that Brussels has already provided other EU countries with too much financial assistance. When it comes to the economy, the French remain quite downbeat. Only 9% thought it was doing well last year, just 12% say it is good this year. Such sentiment is much closer to that in Greece, Italy and Spain than it is to the UK and Germany. The French are particularly pessimistic about the trajectory of the economy over the next 12 months, 48% say it will worsen. 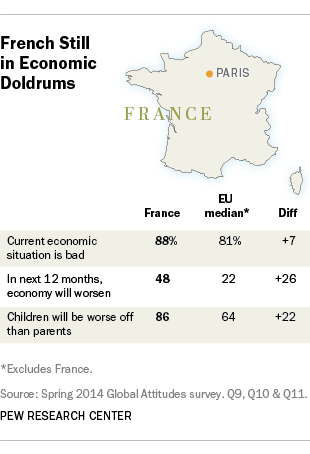 And the French are overwhelmingly convinced that children today will be worse off financially than their parents. This is the most negative assessment of prospects for the next generation of any country surveyed in the EU. Nobody likes their creditor, especially when the creditor forces a debtor country to tighten its belt. And the Greeks are certainly critical of the European Union. Only 17% have a positive view of the European Central Bank. Greeks also take a dim view of the European Commission and the European Parliament. Greeks are also more alienated from the EU than other Europeans surveyed. More than eight-in-ten complain that the EU is intrusive in their daily lives. Other Europeans agree, but are less upset about it. Similarly, 85% of Greeks say the EU is out of touch, significantly greater alienation than that in other parts of Europe. And roughly two-thirds of Greeks view the EU as inefficient, a sentiment they share with other Europeans. The Spanish are among those who are downbeat on the economy, but there are signs that things are relatively improving. Only 8% of the Spanish see their economy as doing well at the present time, but a third of the Spanish expect their economy to improve over the next 12 months. That is not a great deal of public optimism but it is second only to the British (45%). Moreover, the proportion of the Spanish who expect the economy to worsen over the next year has actually declined by 26 percentage points, from 47% in 2012 and 2013 to 21%. Nevertheless, 93% of the Spanish say joblessness is a very big national problem and three-quarters voice the view that public debt (75%) and inequality are very important concerns (74%). While Spanish support for the European Union has not improved significantly since last year, EU favorability among young Spanish – those ages 18 to 29 – has improved markedly, from 46% to 58%, despite the fact that roughly half of all young Spanish are unemployed. And 68% of the Spanish want to retain the euro and not go back to using the peseta.